The fraying in his shoulder will keep a lot of owners away from Jaime Garcia. It will also drive his price way down, possibly into the lower single digits. That provides you with an opportunity to purchase a very talented pitcher on the cheap. Garcia has a great swinging strike rate with a solid K9 that should improve. He has good control and a nice groundball rate. He plays for a very good Cardinals team with a nice defense. For what should be a very small investment you could win big. Garcia is already throwing and will face hitters today (Saturday, Feb. 16th). Jaime Garcia will face hitters for the first time today since his abortive two-inning playoff performance against the Washington Nationals last October when he throws batting practice to a group of Cardinals position players headed by David Freese. Today is the first day that pitchers will throw batting practice. Following Garcia, who had shoulder problems much of last season, will be Shelby Miller, who will pitch to a group of hitters including Yadier Molina and Matt Carpenter. Garcia made nine starts at the end of the 2012 season but was forced out of a playoff game after just two innings against the Washington Nationals after experiencing some shoulder stiffness. 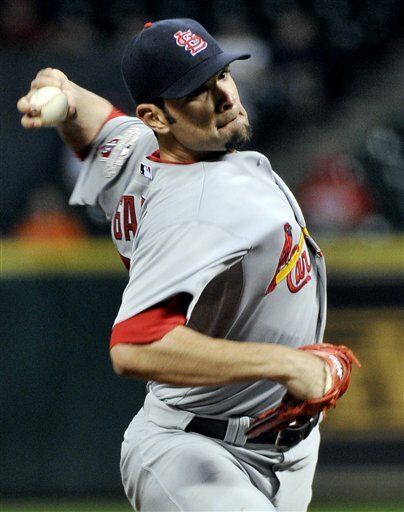 Garcia was declared fully healthy in November after several sessions with the Cardinals coaching and medical staffs. He has been throwing regularly since early January without set-backs or problems. Said pitching coach Derek Lilliquist, "He looks incredibly strong. His arm strength is there and he's in a good frame of mind. We look for good things from Jaime." "It was one of the toughest things I've had to experience in my career," Garcia said. "But you move forward, you learn from the bad and take the good things and move forward and that's what I did this offseason. I went home and had a good, positive mentality and I did everything asked of me to do and worked as hard as I possibly could and I've been saying this the whole time since the Winter Warm-up but I'm feeling healthy, I'm strong and I just want to take it one day at a time. "I came into camp like any other pitcher and obviously there's things I have to take care of which are a part of my career, doing my rehab stuff (between starts), but that's just part of it. But checkups with doctors, we're all clear of that. It's been normal the whole time."